The U.S. has thousands of guardrails installed to protect errant drivers from dangerous fixed objects and steep fill slopes. A majority of these installations were placed years ago using inadequate criteria to place the upstream end of the guardrail to accomodate the need for full protection. As a result, vehicles that run off the road immediately upstream of the guardrail can often travel behind the guardrail and encounter the "protected" hazard. On the other hand, many guardrails installed using more recent American Association of State Highwy and Transportation Officials (AASHTO) guidelines1,2 are so long that they actually increase the expected severity for many impacts that would otherwise encounter a relatively safe contiguous roadside near the end of the guardrail. As a result of the flawed AASHTO procedures1,2, which determine overlong lengths of need, many highway agencies have rejected these procedures and have resorted to a wide variety of rationale for determining shorter guardrail lengths. Many of these installations appear to be too short to adequately protect errant motorists. In a time when many highway agencies are retrofitting new crashworthy guardrail end treatments, an opportunity is available to reconsider the method for determining guardrail length of need so that the guardrail can properly protect errant motorists. Unfortunately, the AASHTO guidelines1,2, rather than giving good guidance on this issue give an unsupported and potentially faulty approach that is demonstrated by rather simplistic examples, which tend to perpetuate this misapplication. An effective guardrail needs to be extended far enough upstream to prevent most errant vehicles from traveling behind the guardrail and striking the roadside hazard. 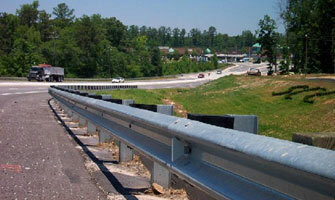 The guardrail should also extend far enough downstream to prevent vehicles from hitting the roadside hazard. If opposing traffic can be expected to crossover and hit the roadside hazard, the downstream end of the guardrail should be extended far enough to shield the roadside hazard from these errant vehicles. Figure 1 shows the factors considered by AASHTO1,2 in determining the length of need, X, for adjacent traffic. The runout length, LR, and the lateral extent of hazard, LH, are the primary factors. The AASHTO runout length, LR, is the theoretical off-road distance needed for a vehicle that has encroached on the roadside to come to a stop. This distance is measured from the upstream end of a roadside hazard, along the roadway, to the point at which the vehicle is assumed to leave the roadway. Once LR and LH are known, the AASHTO length of need depends on the tangent length needed upstream of the hazard, its lateral distance from the travel lanes, L2, and the flare rate, a:b, designed for the installation. The AASHTO1,2 values for guardrail runout length are shown in Table 1. These values are those needed for an off-road vehicle to stop as a function of the operating speed, the available friction between the vehicle tires and the ground, and the expected driver perception-reaction time. Also, AASHTO modifies (no support given) these runout lengths to lesser values for low volume streets and highways. The AASHTO table for guardrail runout lengths as presented is so crucial not only to the safety of errant motorists but also to the cost-effective application of guardrail that the approach seems very meager. The runoff length is based on a faulty premise of trying to intercept every run-off-road vehicle that might ever possibly hit the roadside object at any speed above zero mph. This premise leads to an overly long guardrail that will intercept many other ran-off-road vehicles that would never have otherwise hit the roadside object. The concept of runout length needs to be replaced by a more logical rationale. The major flaw in the AASHTO procedure can be illustrated by the simple example shown in Figure 2. This theoretical roadside has a 10x10 foot fixed object that is offset 10 feet from the traveled way of a 70-mph freeway carrying 8000 vehicles per day. For the purpose of this example, assume that the severity index value of the fixed object face or corner equals 7, the severity index value of the fixed object side equals 4, the severity index value of the guardrail is 4, and the severity index of the contiguous roadside is 4. Therefore, on average, a vehicle impacting the guardrail that would have otherwise impacted the fixed object face or corner will have a drop in severity from 7 to 4 (43%). However, not all vehicles that run off the traveled way near the guardrail will impact the guardrail. Some vehicles that run off near the downstream end, particularly with low encroachment angles, will pass in front of the guardrail. Likewise, some vehicles that run off near the upstream end, particularly with high encroachment angles, will pass behind the guardrail. All of these vehicles that miss hitting the guardrail will experience the lower severity of contiguous roadside regardless of the guardrail. More importantly, some vehicles that impact the guardrail would not have otherwise hit the fixed object, but would have experienced the lower severity of the contiguous roadside. Therefore, the distribution of encroachment angles and the severity index of the contiguous roadside are very important variables needed to determine the proper guardrail length. Applying the encroachment angle distribution found by Hutchinson and Kennedy3, (shown in Figure 3) to the example in Figure 2, Table 2 demonstrates that when the contiguous roadside is less severe than the guardrail, the percentage of impacts with the guardrail that will have increased severity increases with guardrail length until it exceeds the percentage of impacts with decreased severity. If, this tradeoff point were used as a guardrail length of need criterion, the length for this example would be about 180 feet shorter than the AASHTO length of need. More appropriately, an incremental benefit/cost analysis using a 1.0 criterion could be used to determine length of need based on the severity differential and the number of expected impacts, which is a function of traffic volume, roadway curvature, and lateral offset. The roadside hazard model developed by Glennon4 and described in the Roadside Design Guide could be adapted for determining the expected impacts. If, in the previous example, the severity index of the contiguous roadside equals the severity index of the guardrail, impacts with the guardrail, on average, will never have a higher severity than impacts that would have otherwise occurred with the contiguous roadside. But the severity benefits of shielding the fixed object will diminish with length, as shown in Table 3. In this case, an incremental benefit/cost analysis is even more appropriate for determining the optimum length, which will be somewhat longer than in the previous example. If the severity index of the contiguous roadside is greater than the guardrail severity index, guardrail impacts will have a lower severity, on average. Under these conditions, the length of need is generally determined in that area upstream where the contiguous roadside becomes less severe than the guardrail. This determination is an entirely different exercise as described later. This discussion generally demonstrates that each roadside situation has a unique guardrail length of need. Other variables also contribute to the determination, including fixed object size and lateral offset and the complex variability of contiguous roadside severity index both along the roadway and laterally. As discussed before, some impacts along the guardrail will have increased rather than decreased severity so an incremental benefit/cost analysis is more appropriate. According to other parts of the Roadside Design Guide (see Figure 5), 2:1 is not the critical slope for determining guardrail. Rather, any slope steeper than 3:1 is critical (e.g., 2.9:1). The method does not account for a common situation when the roadside proceeds from cut to fill. For this situation, there often exist a very hazardous slope that is perpendicular to the traveled way. The illustration does not account for the total AASHTO procedure, which suggests that the bottom five feet of height on a 2:1 slope does not need guardrail protection (see Figure 5). Sometimes, highway agencies install guardrails that are too long and, in so doing, spend money to increase roadside hazard. Other times, highway agencies install guardrails that are too short and, thereby, miss cost-beneficial reductions in roadside hazard. The latter is particularly true where guardrail flares are taken out to put in parallel-installed ET-2000 end treatments. If the pre-existing guardrail was too short and it is not lengthened to accommodate the longer length of need for parallel installations, the $2,000-3,000 improvement may have a negative benefit. Clearly, a better procedure is urgently needed for determining guardrail length of need. Develop a framework for analyzing the incremental severity change associated with guardrail protection for fill slopes on both tangent and curved roadways as a function of clear zone width [including consideration of perpendicular slopes and hazardous bodies of water at the toe of the slope]. Develop a framework for analyzing the incremental severity change associated with guardrail protection at fixed objects on both tangent and curved roadway sections for a range of contiguous roadside configurations. Analyze the benefit/cost tradeoff for guardrail runout length as a function of fixed object size and lateral placement, roadside slope configuration, roadway geometry, traffic volume, and traffic speed. Develop a comprehensive user's procedure for determining guardrail length of need as a function of all appropriate variables. Apply sensitivity analyses to determine where reasonable generalizations can be used to simplify the application [one simple example is rounding guardrail length to the nearest 12.5-foot rail increment]. 2. American Association of State Highway and Transportation Officials, Guide for Selecting, Locating, and Designing Traffic Barriers, 1977. 3. Hutchinson, J.W. and Kennedy, T.W., Safety Considerations In Median Design, Highway Research Record 162, 1966. A Cost- Effectiveness Priority Approach, Transportation Research Board, NCHRP Report 148, 1974. 5. Ross, H.E. et. al., Warrants for Guardrail on Embankments, Highway Research Board, Record 460, 1973. 6. Turner, Daniel S., and Hall, Jerome W., Severity Indices for Roadside Features, National Cooperative Highway Research Program, Synthesis of Highway Practice 202, 1994. 7. Glennon, J.C. and Tamburri, T.N., Objective Criteria for Guardrail Installation, Highway Research Board, Record 174, 1967. 8. Glennon, John C., and Wilton, Cathy J.,Effectiveness of Roadside Safety Improvements, Federal Highway Administration, Report No. FHWA-RD-75-23, 1974. 9. Graham, J.L., and Harwood, D.W., Effectiveness of Clear Recovery Zones, Transportation Research Board, NCHRP Report No. 247, 1982. 10. Weaver, Graeme D., Marquis, Eugene L., and Olson, Robert M., Selection of Safe Roadside Cross Sections, Transportation Research Board, NCHRP Report No. 158, 1975. 11. Zeeger, C.V., et. al.,Safety Effects of Cross-Section Design for Two- Lane Roads, Federal Highway Administration, Report No. FHWA-RD-87-008, 1987. 12. 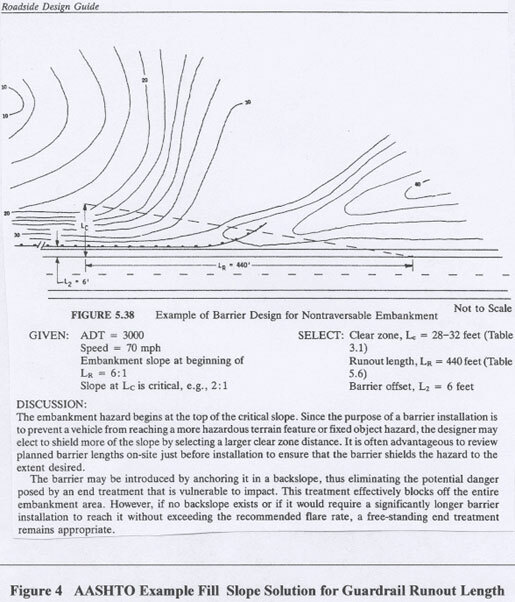 Highway Research Board, Highway Guardrail - Determination of Need and Geometric Requirements, Special Report 81, 1964. 13. Perchonok, K., et. al., Hazardous Effects of Highway Features and Roadside Objects, Federal Highway Administration, Report No. FHWA-RD-78-202, 1978. 14. Stonex, K.A., Roadside Design for Safety, Highway Research Board Proceedings, 1960. 15. Olson, Robert M., Post, Edward R., and McFarland, William F., Tentative Service Requirements for Bridge Rail Systems, Transportation Research Board, NCHRP Report 86, 1970. 16. Sicking, Dean L., Gereshy, Asif B., and Ross, Hayes E., Jr., Development of Guardrail Extruder Terminal, Texas Transportation Institute, Paper No. 880484, 1989. 17. Federal Highway Administration, Synthesis of Safety Research Related to Traffic Control and Roadway Elements, Volume 1, Chapter 3, 1982. 18. Federal Highway Administration, A Handbook of Highway Safety Design and Operating Practices, 1968, 1973, and 1978. 19. Federal Highway Administration, Maintenance and Highway Safety Handbook, 1977. 20. Federal Highway Administration, Roadside Improvements for Local Roads and Streets, 1986. 21. Transportation Research Board, Designing Safer Roads, Special Report 214, 1987. 22. Ivey, Don L., Bronstad, M.E., and Griffin, Lindsay I., III, Guardrail End Treatments in the 1990?s, Texas Transportation Institute, Paper No. 920910, 1992. Highway Features, Transportation Research Board, NCHRP Report 350, 1993. 24. Michie, J.D., and Calcote, L.R., Location, Selection, and Maintenance of Highway Guardrails and Median Barriers, Transportation Research Board, NCHRP Report 54, 1968. 25. Glennon, J.C., Neuman, T.R., and Leisch, J.E.,Safety and Operational Considerations for Design of Rural Highway Curves, Federal Highway Administration, 1983. 26. "The Desirability of Highway Design for Operating Speeds Above 70 MPH,? Proceedings, Institute of Traffic Engineers, 1970. 27. Center for Auto Safety, The Yellow Book Road: The Failure of America?s Roadside Safety Program, 1974. 28. American Association of State Highway and Transportation Officials, Highway Design and Operational Practices Related to Highway Safety, 1974.